Zingiber officinale is a herbaceous, perennial plant, with upright stems and aromatic, warty and branched rhizome. Leaves are long, lanceolate to linear-lanceolate, green in color. Flowers are produced in a dense spike, yellow green with purple endings. Ginger is an old herbal medicine. 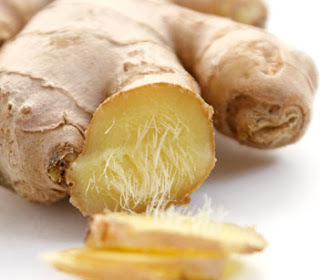 Chinese healers recommended Ginger for different ailments: abdominal bloating, cough, diarrhea, rheumatism. Tibetan medical system considers Ginger to be helpful in treatment of various inflammatory joint diseases. Nowadays, Ginger is accepted as a remedy for different forms of nausea and vomiting problems: motion and morning sickness and problems with indigestion. Ginger is also considered helpful in treatments of headaches, menstrual pain, sore throat, fevers, and ulcerative colitis. Some gastrointestinal problems, such as gases and heartburn, can also be alleviated with Ginger.